I don't know much about timing on the ZX81 and the Z80 processor. I do however have Rodnay Zaks Programming the Z80 where is states that LD r,n is 2 M cycles and 7 T states. Not that this makes much sense to me. So I'm guessing I need to find an instruction in the loop that draws the line, and replace a 2 M cycle instruction with a 3 M instruction, or replace a 4 M with a 5 M? Reading further in the book it seems that T states = clock cycles. So it seems I need an extra T state in the loop that draws the line. I was hoping to have the same ROM in the ZXpand for both ZX81 and Lambda 8300, but that seems down the drain now. giving 1 more T-state. But it did not solve it. Perhaps it is the INT routine? 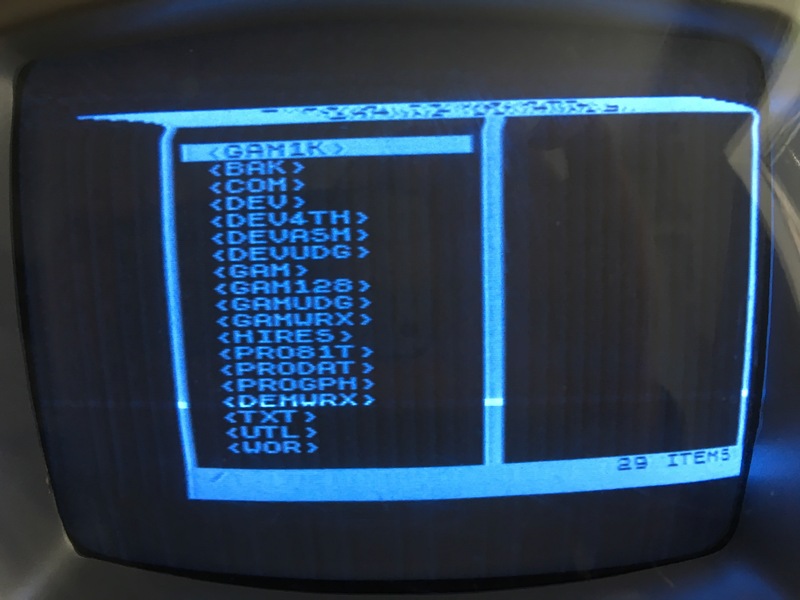 The routine in the ZX81 compatible Lambda ROM is I think slightly different from the normal ZX81 INT routine which the ZXpand is using? Thanks for your feedback. I'll try to look at the disassembly of the ZX81 ROM, the Lambda 8300 ROM and the modified ZX81 ROM for Lambda 8300. I'll change a few bytes and see if that helps. However... this also appears when I call my hires without enough empty lines on top. Also you can alter A below to shift display in columns. What picture do you get from loading 1 of my 1K hires games? This could determine if it is lowres or hirescontrol (timer per line). The jumping text is what I had too when writing lowres too soon (not enough NL) to the screen. Remember that Lambda 8300 does NOT do Pseudo Hires, WRX or UDG. This is due to the different ULA where charset is inside the ULA. The picture was only relevant to see if 208 tstates were used. Since the graphic is outlined to left is is proven that is is indeed 208 tstates.